Disturbing and inspirational. I am could not avoid responding, so it's up. Good writing, my friends...have at it! I could write only disturbing words. As so many asked, where was the fun in funhouse? Ooh this was a fun one! No pun intended. Eeek! Sorry. I must have posted twice! Any way I could delete the other? this one took a bit of cogitating! Have a great week! 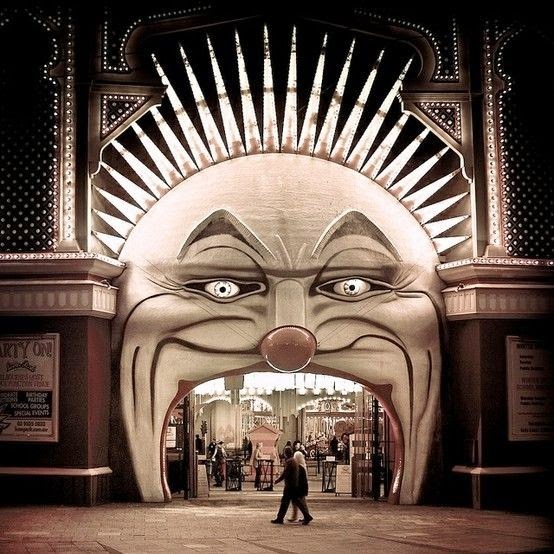 Amazing how scary an entrance can be, but then roller coasters and all that carnival jazz can be scary! This capture is very unique! It's a very kool prompt I had fun writing about it. I went a few directions before deciding on mine. It's done. Hard to linger on that picture. Wonderful prompt. Bit of a struggle this week due to my pigheadedness....... but I got there!